Growing up, I was clueless at how uncommon and special some of our home-cooked meals were. All I knew was that I felt genuinely satiated every after meal time! Those dishes were hand me down gastronomic delights from my lolas who’ve had the most intense affair with cooking. Off hand, I can think of three dishes that are extremely rich in flavor but are virtually unknowns, these are: calandracas (a one-pot wonder of beef stock, beef cubes, macaroni, potatoes, veggies and chorizos), afritada (Nueva Ecijano style) and another Nueva Ecijano dish, tinumis. (Just a sidebar– My lola was an Ilongga who cooked Nueva Ecijano dishes because of my lolo who hailed from Nueva Ecija). It’s been sometime last I cooked afritada, Nueva Ecijano style. Ah, how I loved hovering in the kitchen when I was a child watching my mom whip up this dish. As you know, the typical afritada uses the regular tomato sauce plus spices to boot. In fact, instant sauces have become too handy that stewing has almost been forgotten. The Nueva Ecijano version does away with using the commercially available tomato sauce. The glaring difference in the ecijano version is the fact that they make the meat into adobo first before they turn it into afritada. 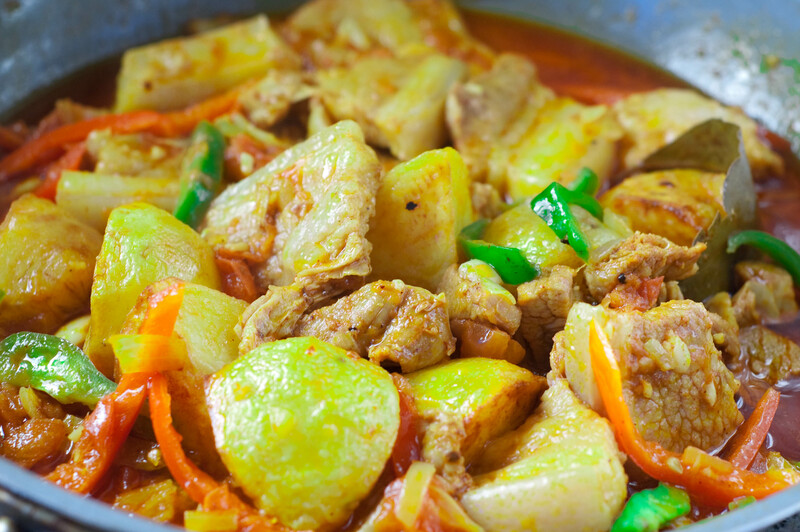 Typically, too, the potatoes you throw into your regular afritada just boils along with the whole dish without giving much flavor. In this version, these tubers are fried to extract the savory taste of it. Indeed, It is ‘labor of intense love’ in its truest meaning because nothing here is instant. The final product leaves you guessing what ingredients made flavors that left you asking for more. Anyway, to cut to the chase, here goes my recipe, Afritada, Nueva Ecijano style! 1. In a casserole, place meat marinated in 5 cloves of crushed garlic, salt, pepper, vinegar and water. Set heat to medium. Midway into the cooking, drop in the bay leaf. Continue simmering until liquid has evaporated almost completely. Set aside. 2. Meantime in a small bowl, soak about 3 tablespoons atsuete in a cup of water. 3. In a separate pan, saute garlic, tomato and onion (in that order). The tomatoes should be stewed until thin in consistency. Put in bell peppers. Simmer some more then throw in the adobo. Season with patis. Pour in strained atsuete water. Set aside. 4. In another separate pan, fry quartered potatoes until golden brown. 5. Mix in the fried potatoes into the afritada. Serve right away. yummy! This seems to be the real way to cook it!